Text Editors for Mac OS X are required for more advanced functions than the default text editors like helpful syntax highlighting, macro and tabs. We are in favor of Free Text Editors under GNU GPL or Compatible License. There are GPL-ed and Free from the beginning Text Editors for Mac. Do not use any closed source paid Text Editors for Mac OS X (many website promotes) and if possible try to contribute to make the good free Text Editors for Mac OS X more better by contribution. The paid and / closed source softwares are creating problems and confusion among our users. We will try to avoid writing about the paid and obviously demote them. The reason of demoting is, a person or a group of person if can give any software for free, its inhuman to publish a single line about the paid and / closed source softwares. Text editors born from the need to enter code of computer programs and data into the computer. The precursor of text editors were therefore hole punch cards. The history says that the he first Emacs implementation was by Richard Stallman along with the other developers. These powerful Text Editors has more features than the default TextEdit software of Mac; although feature wise TextEdit is far superior than Notepad, the default Text Editors for Windows OS. With the advent of computer terminals, CLI based text editors became important. One of the first programs of this group include the 1967 written O26 editor on CDC 6000 – mainframes and the vi editor from the year 1976. The Vi editor is still the standard text editor for unix like operating systems. Most has extentionabillity, customization features, supports various programming language’s Syntax Highlighting. More powerful text editors can be used to run Macros, can have automatic code completion feature, automatic indentation, Display of call parameters for functions and methods etc. You can read about Syntax Highlighting separately. TextMate is another software which is historically quite important. TextMate 1.5 won the Apple Design Award in 2006. Vim (Vi IMproved) for Mac OS X : Important because we use to edit the vimrc file for changing the color profile for syntax highlighting for command line simulator like iTerm2. TextWrangler and BBEdit : Both supports Retina Display, quite well known advanced text editor for Mac OS X. TextWrangler can open the kext files. Gedit : gedit is the official text editor of the GNOME desktop environment. We wrote about Windows Gedit before. Please add more names of Text Editors for Mac OS X (under GNU GPL or Compatible License) if you know to be actively existing, through comments. you made running a blog glance easy. The total look of your website is great, let alone the content material! 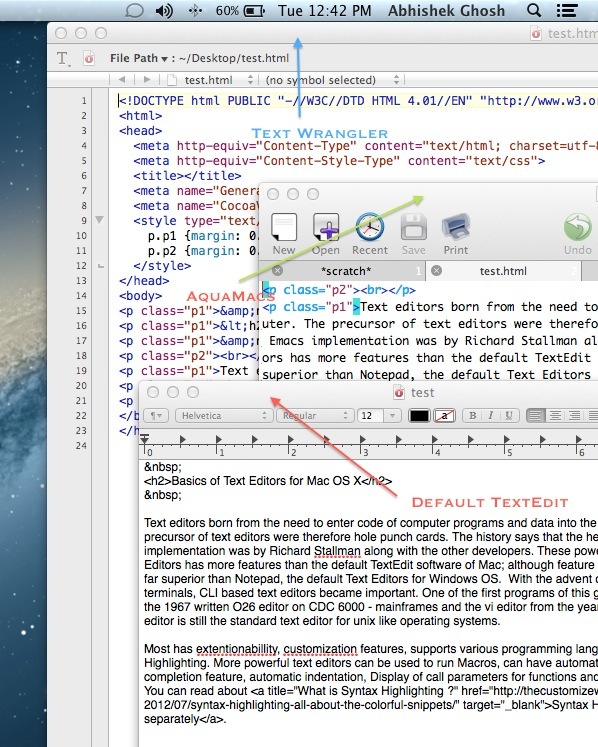 Cite this article as: Abhishek Ghosh, "Text Editors for Mac OS X : Best of the Bests yet Free," in The Customize Windows, March 12, 2013, April 26, 2019, https://thecustomizewindows.com/2013/03/text-editors-for-mac-os-x-best-of-the-bests-yet-free/.